First, know that you can help. Suicide is preventable, and one concerned individual can make a difference. Ask directly if the person is thinking about suicide. Keep them safe and separate them from anything they might use to harm themselves. Listen to what they have to say and avoid dismissing or judging their words. 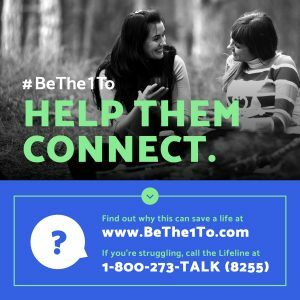 Help them connect to additional support, whether a family member, coach, clergy member, therapist or crisis hotline. Follow up and see how they’re doing. Contact in the days and weeks after a crisis can make a big difference. If you’re concerned about someone, you don’t have to have all the answers – there are a number of organizations with help and information on preventing suicide. If you are in crisis, call the National Suicide Prevention Lifeline at 1-800-273-TALK(8255).